This article is about the type of reptile. For other uses, see Gecko (disambiguation). Geckos are lizards belonging to the infraorder Gekkota, found in warm climates throughout the world. They range from 1.6 to 60 cm (0.64 to 24 inches). Most geckos cannot blink, but they often lick their eyes to keep them clean and moist. They have a fixed lens within each iris that enlarges in darkness to let in more light. Geckos are unique among lizards in their vocalizations, which differ from species to species. They use chirping or clicking sounds in their social interactions, and sometimes when alarmed. They are the most species-rich group of lizards, with about 1,500 different species worldwide. The New Latin gekko and English "gecko" stem from the Indonesian-Malay gēkoq, which is imitative of sounds that some species make. All geckos except species in the family Eublepharidae lack eyelids; instead the outer surface of the eyeball has a transparent membrane, the cornea. Species without eyelids generally lick their own corneas when they need to clear them of dust and dirt. Nocturnal species have excellent night vision; their color vision in low light is 350 times more sensitive than human color vision. The nocturnal geckos evolved from diurnal species which had lost the eye rods. The gecko eye therefore modified its cones that increased in size into different types both single and double. Three different photopigments have been retained and are sensitive to UV, blue, and green. They also use a multifocal optical system that allows them to generate a sharp image for at least two different depths. Most gecko species can lose their tails in defense, a process called autotomy. Many species are well known for their specialised toe pads that enable them to climb smooth and vertical surfaces, and even cross indoor ceilings with ease. Geckos are well known to people who live in warm regions of the world, where several species of geckos make their home inside human habitations. These (for example the house gecko) become part of the indoor menagerie and are often welcomed, as they feed on insects, including moths and mosquitoes. Unlike most lizards, geckos are usually nocturnal. Like other reptiles, geckos are ectothermic, producing very little metabolic heat. Essentially a gecko's body temperature is dependent on its environment. Also, in order to accomplish their main functions—such as locomotion, feeding, reproduction, etc.—geckos must have a relatively elevated temperature. All geckos shed their skin at fairly regular intervals, with species differing in timing and method. Leopard geckos will shed at about two- to four-week intervals. The presence of moisture aids in the shedding. When shedding begins, the gecko will speed the process by detaching the loose skin from its body and eating it. For young geckos, shedding will occur more frequently, at once every week. But when they fully grow, they shed once every one or two months. About 60% of gecko species have adhesive toe pads that allow them to adhere to most surfaces without the use of liquids or surface tension. Such pads have been gained and lost repeatedly over the course of gecko evolution. Adhesive toepads evolved independently in about 11 different gecko lineages and were lost in at least 9 lineages. The spatula-shaped setae arranged in lamellae on gecko footpads enable attractive van der Waals' forces (the weakest of the weak chemical forces) between the β-keratin lamellae/setae/spatulae structures and the surface. These van der Waals interactions involve no fluids; in theory, a boot made of synthetic setae would adhere as easily to the surface of the International Space Station as it would to a living-room wall, although adhesion varies with humidity. A recent study has however shown that gecko adhesion is in fact mainly determined by electrostatic interaction (caused by contact electrification), not van der Waals or capillary forces. The setae on the feet of geckos are also self-cleaning and will usually remove any clogging dirt within a few steps.Teflon, which has very low surface energy, is more difficult for geckos to adhere to than many other surfaces. Gecko adhesion is typically improved by higher humidity, even on hydrophobic surfaces, yet is reduced under conditions of complete immersion in water. The role of water in that system is under discussion, yet recent experiments agree that the presence of molecular water layers (water molecules carry a very large dipole moment) on the setae as well as on the surface increase the surface energy of both, therefore the energy gain in getting these surfaces in contact is enlarged, which results in an increased gecko adhesion force. Moreover, the elastic properties of the b-keratin change with water uptake. Geckos' toes operate well below their full attractive capabilities most of the time, because the margin for error is great depending upon the surface roughness, and therefore the number of setae in contact with that surface. Use of small van der Waals force requires very large surface areas: every square millimeter of a gecko's footpad contains about 14,000 hair-like setae. Each seta has a diameter of 5 μm. Human hair varies from 18 to 180 μm, so the cross-sectional area of a human hair is equivalent to 12 to 1300 setae. Each seta is in turn tipped with between 100 and 1,000 spatulae. Each spatula is 0.2 μm long (one five-millionth of a meter), or just below the wavelength of visible light. The setae of a typical mature 70 g (2.5 oz) gecko would be capable of supporting a weight of 133 kg (293 lb): each spatula can exert an adhesive force of 5 to 25 nN. The exact value of the adhesion force of a spatula varies with the surface energy of the substrate to which it adheres. Recent studies  have moreover shown that the component of the surface energy derived from long-range forces, such as van der Waals forces, depends on the material's structure below the outermost atomic layers (up to 100 nm beneath the surface); taking that into account, the adhesive strength can be inferred. Recent studies have also revealed that apart from the setae, phospholipids—fatty substances produced naturally in their bodies—also come into play. These lipids lubricate the setae and allow the gecko to detach its foot before the next step. The origin of gecko adhesion likely started as simple modifications to the epidermis on the underside of the toes. This was recently discovered in the genus Gonatodes from South America. Simple elaborations of the epidermal spinules into setae have enabled Gonatodes humeralis to climb smooth surfaces and sleep on smooth leaves. Biomimetic technologies designed to mimic gecko adhesion could produce reusable self-cleaning dry adhesives with many applications. Development effort is being put into these technologies, but manufacturing synthetic setae is not a trivial material design task. Gecko skin does not generally bear scales but appears at a macro scale as a papillose surface which is made from hair-like protuberances developed across the entire body. These confer superhydrophobicity, and the unique design of the hair confers a profound antimicrobial action. These protuberances are very small, up to 4 microns in length, and tapering to a point. Gecko skin has been observed to have an anti-bacterial property, killing gram-negative bacteria when it comes in contact with the skin. Geckos are polyphyodonts and able to replace each of their 100 teeth every 3 to 4 months. Next to the full grown tooth there is a small replacement tooth developing from the odontogenic stem cell in the dental lamina. The formation of the teeth is pleurodont; they are fused (ankylosed) by their sides to the inner surface of the jaw bones. This formation is common in all species in the order Squamata. Pores on the skin are often used in classification. The infraorder Gekkota is divided into eight families, containing numerous genera of gecko species. Coleonyx variegatus, the western banded gecko, is native to the southwestern United States and northwest Mexico. Cyrtopodion brachykolon, the bent-toed gecko, is found in northwestern Pakistan; it was first described in 2007. 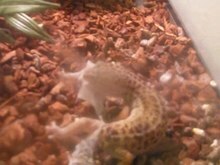 Eublepharis macularius, the leopard gecko, is the most common gecko kept as a pet; it does not have adhesive toe pads and cannot climb the glass of a vivarium. Gehyra mutilata (Peropus mutilatus), the stump-toed gecko, is able to vary its color from very light to very dark to camouflage itself; this gecko is at home in the wild, as well as in residential areas. Gekko gecko, the Tokay gecko, is a large, common, Southeast Asian gecko known for its aggressive temperament, loud mating calls, and bright markings. Hemidactylus is genus of geckos in which there are many varieties. Hemidactylus frenatus, the Common house gecko, thrives around people and human habitation structures in the tropics and subtropics worldwide. Hemidactylus garnotii, the Indo-Pacific gecko, is found in houses throughout the tropics, and has become an invasive species of concern in Florida and Georgia in the US. Hemidactylus mabouia, the Tropical house gecko, Afro-American house gecko or Cosmopolitan house gecko, is a species of house gecko native to sub-Saharan Africa and also currently found in North, Central and South America and the Caribbean. Hemidactylus turcicus, the Mediterranean house gecko, is frequently found in and around buildings, and is an introduced species in the US. Lepidodactylus lugubris, the mourning gecko, is originally an East Asian and Pacific species; it is equally at home in the wild and residential neighborhoods. Pachydactylus bibroni, Bibron's gecko, is native to southern Africa; this hardy arboreal gecko is considered a household pest. 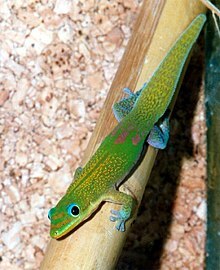 Phelsuma laticauda, the gold dust day gecko, is diurnal; it lives in northern Madagascar and on the Comoros. It is also an introduced species in Hawaii. Ptychozoon is a genus of arboreal geckos from Southeast Asia also known as flying or parachute geckos; they have wing-like flaps from the neck to the upper leg to help them conceal themselves on trees and provide lift while jumping. Rhacodactylus is genus of geckos native to New Caledonia. Rhacodactylus ciliatus, the crested gecko, was believed extinct until rediscovered in 1994, and is gaining popularity as a pet. Rhacodactylus leachianus, the New Caledonian giant gecko, was first described by Cuvier in 1829; it is the largest living species of gecko. Sphaerodactylus ariasae, the dwarf gecko, is native to the Caribbean Islands; it is the world's smallest lizard. Tarentola mauritanica, the crocodile or Moorish gecko, is commonly found in the Mediterranean region from the Iberian Peninsula and southern France to Greece and northern Africa; their most distinguishing characteristics are their pointed heads, spiked skin, and tails resembling those of a crocodile. ^ * Arnold, E.N. ; Poinar, G. (2008). "A 100 million year old gecko with sophisticated adhesive toe pads, preserved in amber from Myanmar (abstract)" (PDF). Zootaxa. Retrieved August 12, 2009. Borsuk-Białynicka, M. (1990). "Gobekko cretacicus gen. et. sp. n., a new gekkonid lizard from the Cretaceous of the Gobi Desert". Acta Palaeontologica Polonica. 35 (1–2): 67–76. Conrad, Jack L.; Norell, Mark A. (1 December 2006). "High-resolution X-ray computed tomography of an Early Cretaceous gekkonomorph (Squamata) from Öösh (Övörkhangai; Mongolia)". Historical Biology. 18 (4): 405–431. doi:10.1080/08912960600679570. Conrad, Jack L. (3 June 2008). "Phylogeny and Systematics of Squamata (Reptilia) Based on Morphology". Bulletin of the American Museum of Natural History. 310: 1–182. doi:10.1206/310.1. Bauer, Aaron M.; Böhme, Wolfgang; Weitschat, Wolfgang (April 2005). "An Early Eocene gecko from Baltic amber and its implications for the evolution of gecko adhesion". Journal of Zoology. 265 (4): 327–332. doi:10.1017/S0952836904006259. ^ "Search results - The Reptile Database". ^ gecko, n. Oxford English Dictionary Second edition, 1989; online version September 2011. Accessed 29 October 2011. Earlier version first published in New English Dictionary, 1898. ^ Badger, David (2006). Lizards: a Natural History of Some Uncommon Creatures. St. Paul, MN: Voyageur Press. p. 47. ISBN 978-0760325797. ^ Roth, L.S.V. ; Lundstrom, L.; Kelber, A.; Kroger, R. H. H.; Unsbo, P. (1 March 2009). "The pupils and optical systems of gecko eyes". Journal of Vision. 9 (3): 27.1–11. doi:10.1167/9.3.27. PMID 19757966. ^ Roth, Lina S. V.; Lundström, Linda; Kelber, Almut; Kröger, Ronald H. H.; Unsbo, Peter (1 March 2009). "The pupils and optical systems of gecko eyes". Journal of Vision. 9 (3): 27. doi:10.1167/9.3.27. PMID 19757966. ^ "Gecko-inspired multifocal contact lenses, cameras on the anvil". 8 May 2009. ^ Mihai, Andrei (Sep 9, 2009). "Gecko tail has a mind of its own". ZME Science. ^ Piper, Ross (2007). Extraordinary Animals: an Encyclopedia of Curious and Unusual Animals. Westport, Conn.: Greenwood Press. p. 143. ISBN 978-0313339226. ^ a b Girons, Hubert (August 1980). "Thermoregulation in Reptiles with Special Reference to the Tuatara and Its Ecophysiology Tuatara: Volume 24, Issue 2, August 1980. Victoria University of Wellington Library". Retrieved May 31, 2014. ^ "Buddy Genius - Pet me. Touch me, Love me". ^ a b c Gamble, Tony; Greenbaum, Eli; Jackman, Todd R.; Russell, Anthony P.; Bauer, Aaron M.; Castresana, Jose (June 27, 2012). "Repeated Origin and Loss of Adhesive Toepads in Geckos". PLoS ONE. 7 (6): e39429. Bibcode:2012PLoSO...739429G. doi:10.1371/journal.pone.0039429. PMC 3384654. PMID 22761794. ^ "Scientific Image - Gecko Toe - NISE Network". ^ Santos, Daniel; Matthew Spenko; Aaron Parness; Kim Sangbae; Mark Cutkosky (2007). "Directional adhesion for climbing: Theoretical and practical considerations". Journal of Adhesion Science and Technology. 21 (12–13): 1317–1341. doi:10.1163/156856107782328399. Gecko "feet and toes are a hierarchical system of complex structures consisting of lamellae, setae, and spatulae. The distinguishing characteristics of the gecko adhesion system have been described [as] (1) anisotropic attachment, (2) high pulloff force to preload ratio, (3) low detachment force, (4) material independence, (5) self-cleaning, (6) anti-self sticking and (7) non-sticky default state. ... The gecko's adhesive structures are made from ß-keratin (modulus of elasticity [approx.] 2 GPa). Such a stiff material is not inherently sticky; however, because of the gecko adhesive's hierarchical nature and extremely small distal features (spatulae are [approx.] 200 nm in size), the gecko's foot is able to intimately conform to the surface and generate significant attraction using van der Waals forces. ^ a b c d Puthoff, J.B.; Prowse, M.; Wilkinson, M.; Autumn, K. (2010). "Changes in materials properties explain the effects of humidity on gecko adhesion". Journal of Experimental Biology. 213 (21): 3699–3704. doi:10.1242/jeb.047654. PMID 20952618. ^ a b c d Prowse, M.S. ; Wilkinson, Matt; Puthoff, Jonathan B.; Mayer, George; Autumn, Kellar (2011). "Effects of humidity on the mechanical properties of gecko setae". Acta Biomaterialia. 7 (2): 733–738. doi:10.1016/j.actbio.2010.09.036. PMID 20920615. ^ Izadi, H.; Stewart, K. M. E.; Penlidis, A. (9 July 2014). "Role of contact electrification and electrostatic interactions in gecko adhesion". Journal of the Royal Society Interface. 11 (98): 20140371. doi:10.1098/rsif.2014.0371. PMC 4233685. PMID 25008078. We have demonstrated that it is the CE-driven electrostatic interactions which dictate the strength of gecko adhesion, and not the van der Waals or capillary forces which are conventionally considered as the main source of gecko adhesion. ^ How Geckos Stick to Walls. ^ Xu, Quan; Wan, Yiyang; Hu, Travis Shihao; Liu, Tony X.; Tao, Dashuai; Niewiarowski, Peter H.; Tian, Yu; Liu, Yue; Dai, Liming; Yang, Yanqing; Xia, Zhenhai (20 November 2015). "Robust self-cleaning and micromanipulation capabilities of gecko spatulae and their bio-mimics". Nature Communications. 6: 8949. Bibcode:2015NatCo...6E8949X. doi:10.1038/ncomms9949. PMC 4673831. PMID 26584513. ^ Why do the gecko's feet not stick to a teflon surface?. ^ a b c d Huber, G.; Mantz, H.; Spolenak, R.; Mecke, K.; Jacobs, K.; Gorb, S.N. & Arzt, E. (2005). "Evidence for capillarity contributions to gecko adhesion from single spatula nanomechanical measurements". Proceedings of the National Academy of Sciences. 102 (45): 16293–6. Bibcode:2005PNAS..10216293H. doi:10.1073/pnas.0506328102. PMC 1283435. PMID 16260737. ^ a b Chen, B.; Gao, H. (2010). "An alternative explanation of the effect of humidity in gecko adhesion: stiffness reduction enhances adhesion on a rough surface". International Journal of Applied Mechanics. 2 (1): 1–9. Bibcode:2010IJAM....2....1C. doi:10.1142/s1758825110000433. ^ a b c Loskill, P.; Puthoff, J.; Wilkinson, M.; Mecke, K.; Jacobs, K.; Autumn, K. (September 2012). "Macroscale adhesion of gecko setae reflects nanoscale differences in subsurface composition". Journal of the Royal Society Interface. 10 (78): 20120587. doi:10.1098/rsif.2012.0587. PMC 3565786. PMID 22993246. ^ Russell, A. P. (1975). "A contribution to the functional analysis of the foot of the Tokay, Gekko gecko (Reptilia: Gekkonidae)". Journal of Zoology. 176 (4): 437–476. doi:10.1111/j.1469-7998.1975.tb03215.x. ^ Autumn, Kellar; Sitti, M.; Liang, Y.A. ; Peattie, A.M.; Hansen, W.R.; Sponberg, S.; Kenny, T.W. ; Fearing, R.; Israelachvili, J.N. ; Full, R.J. (2002). "Evidence for van der Waals adhesion in gecko setae". Proceedings of the National Academy of Sciences. 99 (19): 12252–12256. Bibcode:2002PNAS...9912252A. doi:10.1073/pnas.192252799. PMC 129431. PMID 12198184. ^ "Geckos can hang upside down carrying 40kg". physics.org. Retrieved 2 November 2012. ^ Autumn, Kellar (September 29, 2003). "How do gecko lizards unstick themselves as they move across a surface?". Scientific American. Retrieved 23 March 2013. ^ Lee, Haeshin; Lee, Bruce P.; Messersmith, Phillip B. (2007). "A reversible wet/dry adhesive inspired by mussels and geckos". Nature. 448 (7151): 338–341. Bibcode:2007Natur.448..338L. doi:10.1038/nature05968. PMID 17637666. ^ Loskill, P.; Haehl, H.; Grandthyll, S.; Faidt, T.; Mueller, F.; Jacobs, K. (November 2012). "Is adhesion superficial? Silicon wafers as a model system to study van der Waals interactions". Advances in Colloid and Interface Science. 179–182: 107–113. arXiv:1202.6304. doi:10.1016/j.cis.2012.06.006. PMID 22795778. ^ Hsu, P. Y.; Ge, L.; Li, X.; Stark, A. Y.; Wesdemiotis, C.; Niewiarowski, P. H.; Dhinojwala, A. (24 August 2011). "Direct evidence of phospholipids in gecko footprints and spatula-substrate contact interface detected using surface-sensitive spectroscopy". Journal of the Royal Society Interface. 9 (69): 657–664. doi:10.1098/rsif.2011.0370. PMC 3284128. PMID 21865250. ^ Higham, T.E. ; Gamble, T.; Russell, A.P. (2017). "On the origin of frictional adhesion in geckos: small morphological changes lead to a major biomechanical transition in the genus Gonatodes". Biological Journal of the Linnean Society. 120 (3): 503–517. doi:10.1111/bij.12897. ^ Green D W; Lee K K; Watson J A; Kim HY; Yoon KS; Kim EJ; Lee JM; Watson G S; Jung HS (25 January 2017). "High Quality Bioreplication of Intricate Nanostructures from a Fragile Gecko Skin Surface with Bactericidal Properties". Scientific Reports. 7. doi:10.1038/srep41023. PMC 5264400. ^ "EBSCOhost Login". doi:10.1016/j.actbio.2015.03.007,info:pmid/25772496&rft.eissn=1878-7568&rft.epage=122&rft.genre=article&rft.issn=1742-7061&rft.jtitle=acta+biomaterialia&rft_val_fmt=info:ofi/fmt:kev:mtx:journal&rft.pages=109-122&rfr_id=info:sid/webofscience.com:wos:wos&rft.spage=109&rft.stitle=acta+biomater&rft.volume=21&rft.au=green,+david+w.,schwarzkopf,+lin,li,+xin,cribb,+bronwen+w.&site=ftf-live (inactive 2019-02-16). 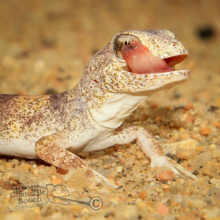 ^ "Mechanism of Tooth Replacement in Leopard Geckos - Developmental Biology Interactive". Archived from the original on 2015-03-12. ^ Gregory R. Handrigan; Kelvin J. Leung; Joy M. Richman (2010). "Identification of putative dental epithelial stem cells in a lizard with life-long tooth replacement". Development. 137 (21): 3545–3549. doi:10.1242/dev.052415. PMID 20876646. ^ Han, D.; Zhou, K.; Bauer, A.M. (2004). "Phylogenetic relationships among gekkotan lizards inferred from c-mos nuclear DNA sequences and a new classification of the Gekkota". Biological Journal of the Linnean Society. 83 (3): 353–368. doi:10.1111/j.1095-8312.2004.00393.x. ^ Gamble, T.; Bauer, A.M.; Greenbaum, E.; Jackman, T.R. (July 2008). "Out of the blue: A novel, trans-Atlantic clade of geckos (Gekkota, Squamata)". Zoologica Scripta. 37 (4): 355–366. doi:10.1111/j.1463-6409.2008.00330.x. ^ Gamble, Tony; Bauer, Aaron M.; Greenbaum, Eli; Jackman, Todd R. (21 August 2007). "Evidence for Gondwanan vicariance in an ancient clade of gecko lizards". Journal of Biogeography: 070821084123003––. doi:10.1111/j.1365-2699.2007.01770.x. ^ Gamble, T.; Bauer, A.M.; Colli, G.R. ; Greenbaum, E.; Jackman, T.R. ; Vitt, L.J. ; Simons, A.M. (February 2011). "Coming to America: Multiple Origins of New World Geckos". Journal of Evolutionary Biology. 24 (2): 231–244. doi:10.1111/j.1420-9101.2010.02184.x. PMC 3075428. PMID 21126276. ^ "THE REPTILE DATABASE". www.reptile-database.org. Retrieved 2016-09-20. Zug, George. Speciation and Dispersal in a Low Diversity Taxon: The Slender Geckos Hemiphyllodactylus (Reptilia, Gekkonidae). Smithsonian Contributions to Zoology, no. 631. Washington, D.C.: Smithsonian Institution Scholarly Press, 2010. Wikimedia Commons has media related to Gekkonidae. Look up gecko in Wiktionary, the free dictionary.